Online Lessons by Leonid Afremov This is a series of 8 video lessons. Here you can see a sample/first lesson http://www.youtube.com/watch?v=jJkx82yuEZI The Lessons are applied as trial and error. 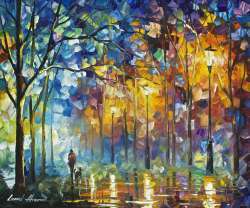 You try to repeat the painting from the video, then Leonid Afremov sends you the comments and what to improve. 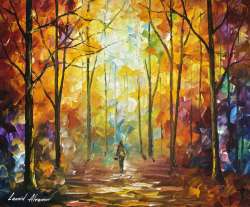 After Leonid Afremov is happy with the results , he gives you the next painting to try. As soon as you complete the payment for the lessons, He will send you all the needed information about the equipment and work place. 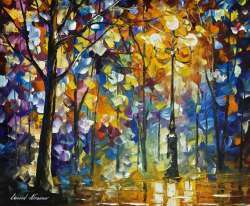 Leonid Afremov dedicates one day a week of his schedule for just Video Lessons only. All the comments are sent on Tuesday of each week. To read more about category "Lecciones de Vídeo en línea" click "Read More"
Just opened the painting and WOW!!!! Didn't know it was possible but it is even more beautiful than the picture! Your talent is truly beyond words! Thank you for bringing such beauty to our home through your artwork. This is only the beginning of what we hope will be an expansive collection. Definitely buying one for my mother in law for her birthday. She loves the color in your leaves. Thank you!! !